Neil Robertson became the first player to make 100 century breaks in a season as he reached the semi-finals of the World Championship with a 13-11 win over Judd Trump. The world number one came from four frames behind at 6-2 overnight to set up a last-four clash with Mark Selby. 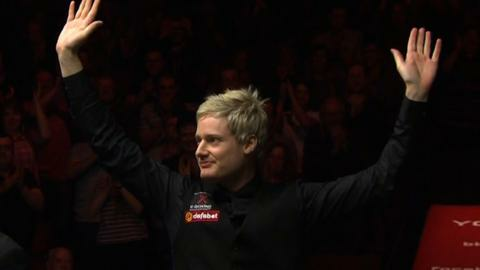 Robertson, 2010 champion, also trailed 9-6 and 11-8 to the world number eight. The Australian made his historic break to tie the match at 11-11 before winning the next two to go through. Robertson, 32, had failed on 99 earlier in the tournament and his relief at clinching his 100th century of the season was clear as he celebrated after sinking a straightforward green in the 22nd frame to reach 101. "Going into tonight's session I'd kind of written it off," Robertson, who beat the previous best of 61 set by Trump last season, told BBC 5 live. "Say if I'd got beat, I was thinking, 'It's alright, Don Bradman got 99 not out, Shane Warne got 99 as well.' But I'd probably have been crying as soon as I got home. "It was great that it came at one of the most crucial times of the match, to equalise at 11-11. When I potted the green I was just so happy. "I would rather make the century of centuries than make a 147 here, it was that important to me to achieve that milestone. "No-one will ever make 200 centuries in a season, that will be impossible, so for me to be the first player to reach 100 centuries in a season is a great honour. I'm sure that a lot of guys will be trying to get there as well, but I'm the first." With a three-frame lead at 11-8 and just two more needed for victory, Trump had seemed the likely winner. But Robertson fought back to close the gap to just one frame for a third time with some attritional play before levelling proceedings with that landmark break. With Trump struggling for momentum, Robertson went 12-11 ahead. Trump's scoring drought had moved into a second hour by the time Robertson gifted him four with a foul to make it 43-4 in the 24th frame. That offered the Englishman a way back in but, having got within eight points, Trump missed what should have been a routine black and Robertson closed out the match with his fifth frame win in a row. "I knew Neil wasn't going to give in," said Trump. "He was going to stick to his game plan. I knew it was going to be close, I'm just a little bit disappointed that, from 11-8, I didn't really get any chances. "I had two balls that rattled and just stayed over the pocket. That kind of summed it up. When they didn't go in, it wasn't going to be my day."